On the HTV2 Mission, JAXA’s H-II Transfer Vehicle (HTV), KONOTORI, will make the second flight to the International Space Station (ISS). During the HTV1 Mission (September 2009), the HTV maiden flight vehicle (HTV1) demonstrated its autonomous and remotely-controlled rendezvous capabilities while delivering cargo/supplies to the ISS. Having achieved the remarkable performance during the HTV1 Mission, the HTV2 Mission will focus on ISS cargo transportation activities. The KOUNOTORI2 reentered Earth's atmosphere at 0:09 p.m. on March 30, over the East Coast of New Zealand. The KOUNOTORI2 successfully completed its cargo supply mission to the ISS. The HTV2 Mission’s primary objectives include launch of the second H-IIB launch vehicle, cargo delivery to the ISS, and support of the station’s trash disposal. After the HTV1 Mission, some modifications were made to HTV’s original configuration and operational procedures based on the HTV1 mission results. During the HTV2 Mission, performances of the modified parts will be monitored. Major modifications are as follows. Of four lights inside the PLC, two lights were replaced to domestic (Japanese) LED lights. The HTV2 delivers approximately 5,300 kg of cargo to the ISS. 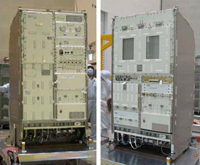 For pressurized cargo, the HTV2 delivers JAXA’s two science racks, KOBAIRO Rack and the Multi-purpose Small Payload Rack (MSPR). This is the first time that the HTV delivers JAXA’s science experiment rack to the ISS. In addition, the HTV2 Mission delivers potable water to the ISS. For unpressurized cargo, the HTV2 delivers NASA’s two Orbital Replacement Units (ORUs), the Cargo Transport Container (CTC) and the Flex Hose Rotary Coupler (FHRC), to the ISS. These unpressurized ORUs will be stored outside of the ISS for later use.